MERV means Minimum Efficiency Reporting Value. It is the industry standard filter performance rating system created by ASHRAE, (The American Society of Heating, Refrigeration and Air Conditioning Engineers). Ultravation® ProgressiveMedia™ filters are available in MERV 11 and MERV 13 performance ratings. The higher the rating, the more efficient the filter is at capturing smaller particles. 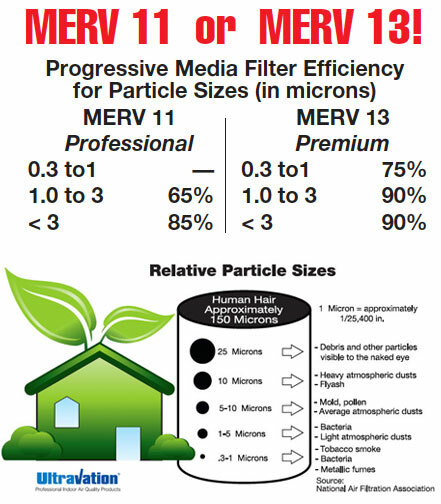 MERV 11 performance standard provides 85% efficiency for particles 3 to 10 microns in size. Pollen and mold can be as small as 10 microns. Ultravation ProgressiveMedia filters lead the field in air-flow restriction. The MERV 13 performance standard provides 90% capture efficiency for particles 3 to 10 microns in size. MERV 13 filters also capture 75% of particulates as small as 0.3 microns –10 times smaller (tobacco smoke particles fall in the 0.3 range). Despite the better particle collection, Ultravation MERV 11 and MERV 13 filters have the same lifespan of up to 1 year. Rugged construction! Ultravation® filter cabinets are US manufactured using U.S. origin galvanized steel, and come with a 10-year warranty (see details on warranty card). All Ultravation air purification products are manufactured in our Vermont facilities! See our manufacturing video. Better particle capture, better efficiency and long filter life! Replace filters every six months in typical environments and more often in harsher situations for efficient use of the filter and minimal restriction of air flow. For a one-inch filter a 30 day interval is best. A filter in use for 12 months should be very full and no longer capturing fine particles and many larger ones. This will cause (1) accumulation of dust and dirt in the HVAC system, (2) increase allergen density in the indoor air and (3) inhibit HVAC efficiency causing it to run longer and work harder, wasting energy. A filter in use for 18 months will be operating beyond capacity and in addition to being ineffective, is likely inhibiting air flow which wastes significant energy, stresses HVAC components and may cause permanent damage to the HVAC system. 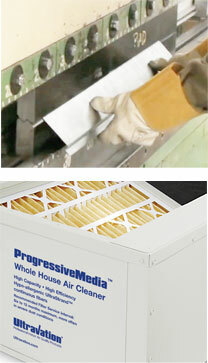 ProgessiveMedia filters the air entering your HVAC system and helps keep it running at top efficiency. By keeping cooling coils cleaner, the heating and cooling process takes less energy.